Your 7 a day in 1 dynamic dose! 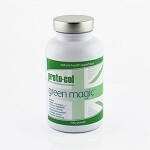 green magicTM is formulated with 16 superfoods selected for their nutritional benefits. Every ingredient is freeze-dried at point of harvest to lock in all the nutritional goodness, so there is no nutritional degradation, which is why just one 3g serving has been tested and found to deliver your 7-a-day nutritional value. Almost everyone struggles to get their 7-a-day, especially as fresh fruit and veg just doesn’t hold the nutritional value we often believe, hence why supplementation is proving to be the most effective way to ensure your body is receiving the vitamins, minerals, trace minerals and nutrients that your body requires daily. 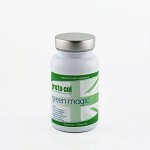 green magicTM has an ORAC value of 1839 per 3g serving, which is 2½ times more powerful than goji berries. 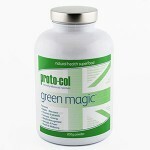 When we start exercising at any level one of the first things that happens is our immune system gets suppressed, this leaves us feeling run down and more likely to become ill. green magic is so powerful that two blind tested clinical studies showed you can actually reverse cellular ageing by up to 13½ years when you take 3 x 3g servings daily for 3 months. By boosting your immune system you will find that your body has more energy to train harder and will recover quicker and stronger. green magicTM is naturally high in dietary fibre and able to neutralise toxic bacteria, which enables your digestive system to function properly. Having a healthy digestive system ensures your body does not build up excess toxins that end up making you feel rundown and lethargic. The blood cleansing properties not only balance and restore a more alkaline ph, they also trap and remove harmful cholesteral. 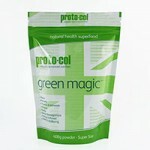 proto-col’s team of World Class and Olympic athletes have all noticed the health benefits that green magic has made – at about 50p per serving isn’t it time that you felt the difference too?